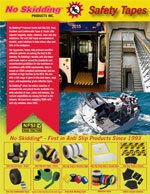 We offer the most complete range of slip resistant floor safety tapes in the industry. Our anti slip safety tapes MEET OR EXCEED: OSHA Spec 1910.24 Stair tread, OSHA Spec 1910.26 Ladder Rungs, Military Spec Mil-D-17951E-Ships, Military Spec Mil-W-5044C-Type IV, Motor Vehicle Safety Standard #302. Our anti slip tapes are all manufactured using the highest quality raw materials that result in a durable application that is resistant to heavy traffic, water and grease. Our tapes provide a consistent co-efficient of friction with easy installation. 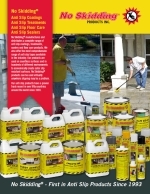 Installation involves simply position, peel-off the release liner and apply to a clean, dry, oil free surface. Our low profile tapes help prevent edge curl and install over most irregular surfaces.